Good or bad employment news? It depends on the data source. According to the seasonally adjusted Local Area Unemployment Statistics (LAUS) data, 2012 was a decidedly bad year for Kansas City area employment. The unemployment rate dropped from 7.2 percent in January to 6.4 percent in December, and on the surface that is good news. But the lower rate was achieved not because we added jobs, but because fewer people were seeking jobs. 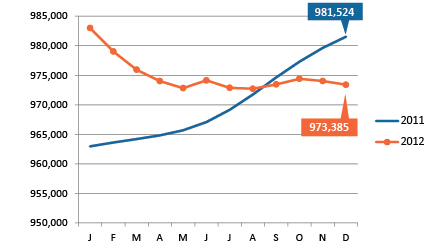 The regional labor force has dropped by 19,000 since January, while employment fell by 9,615. Because jobs fell more slowly than the labor force, the unemployment rate declined. These trends are inconsistent with an economy that we believe is in recovery. Want ads were consistently up from the prior year, and we have had some notable investments in the region by Ford and General Motors. Our economic forecast called for modest employment growth in the year as well. So is the unemployment rate good news or bad? It depends on the data source. The chief alternative local economic barometer we follow is the Current Employment Statistics (CES) data. The CES surveys 486,000 places of work nationwide each month. The size of this survey provides a major advantage over the LAUS employment data, which is based on a much smaller national survey of 60,000 households. The CES data also provides detailed employment by industry. The main drawback to the CES data, for our purposes, is that because it doesn't provide labor force numbers, we can’t use it to calculate the unemployment rate. Unlike LAUS data, the CES shows that the area added employment in 2012, albeit a paltry 2,400 jobs. Another alternative local economic barometer is the Quarterly Census of Employment and Wages (QCEW). QCEW data is the most complete measure of employment, as it collects data on every business establishment that participates in the state’s unemployment Insurance program. Because participation is mandatory for nearly all businesses, it is not considered a survey but rather a census. As with the CES, we just get a figure for employment from the QCEW — there is no measure of labor force or unemployment rate. Another drawback for the QCEW is that the data is not available until six to eight months after the fact, unlike LAUS and CES data which lag only by two months. 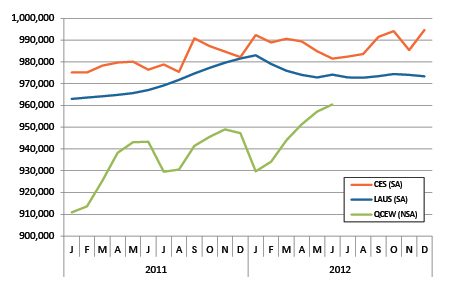 As of this writing, the most current QCEW data available for the Kansas City metro is for June 2012. Also, unlike the other two data series, QCEW data is not available as a seasonally adjusted series. And finally, QCEW data does not include those with jobs that are excluded from unemployment insurance coverage ( such as the self-employed and members of the armed forces) so QCEW employment totals will always be lower than the other sources. Despite these drawbacks, the QCEW data is telling. According to the data, employment in the Kansas City area grew by nearly 31,000 between January and June of 2012. But QCEW data is not seasonally adjusted, so this January to June figure is overstating things. When looking at the seasonal fluctuations, January is typically a relatively slow employment month, as temporary holiday employees lose their jobs. June is an employment peak as students find temporary summer work. As data for the rest of 2012 arrives, we can expect QCEW to dip in July before growing again later in the year, following the seasonal pattern. 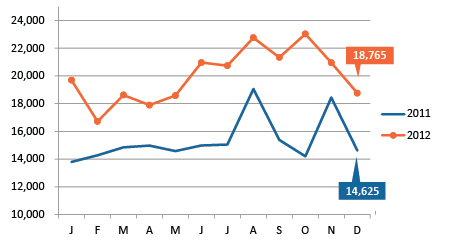 Since there are seasonal fluctuations in the QCEW data, we need to compare the June 2012 figure to the June 2011 figure to truly compare apples to apples. By that measure, the region added more than 17,000 jobs in a year’s time. By contrast, over this same period LAUS estimates the region added 9,379 jobs, while CES estimates the region gained 5,100 jobs. It is important to note that the CES benchmarks its data to the QCEW once each year. This benchmarking will take place with next month’s data release. It is possible that we will see CES employment revised up to reflect what appears to be solid employment growth as measured by the QCEW. This is precisely what happened last year. Candidly, we are rooting for a similar upward revision this year to help make reconciling the many different measures of local economic trends a bit easier. So, where does this leave us in our efforts to accurately track employment in the Kansas City area? For the time being, we will track all three of these data series, as each has something to add. We will continue to use the LAUS for the seasonally adjusted unemployment rate. We'll keep tabs on the labor force figure, but focus on gaining a better understanding of the employment level by using all three data sources. For now, the employment picture in Kansas City is clearly mixed, but next month’s data promises to bring a bit more clarity. We'll make a more in-depth, year-in-review presentation to the Regional Workforce Intelligence Network (RWIN) on Wednesday, Feb. 6, and will post the presentation on kcworkforce.com. After dropping sharply during the first part of the year, employment stabilized in second half of 2012. The regional labor force has shrunk by 19,000 since January 2011. The current labor force is just below 1,040,000. 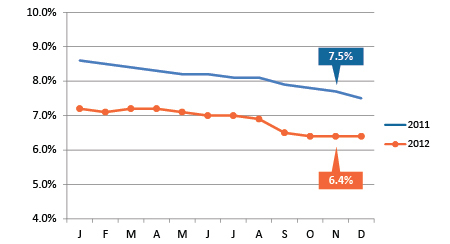 The seasonally adjusted unemployment rate stood at 6.4 percent at the end of 2012. 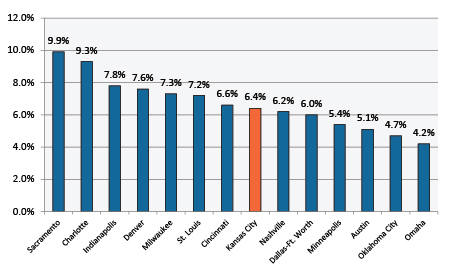 Kansas City's unemployment rate remains firmly in the middle of its peer metros. December job postings dropped to the lowest point since May, but remain well above last year's level.